The Index opened flat but saw huge sell-off from the onset break one support level after another and closed below 8100 for the first time this year. The index closed shop at 8097.00, the biggest single day drop of 227.80 points in recent times. The broader market was also very weak, with just 178 advances to 1337 declines. Developing Range as per Option Table has moved down to 8000-8500. 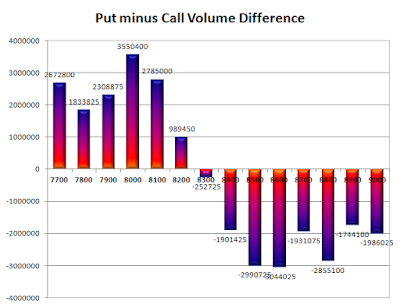 Call option 8000-8800 added huge 61.11 lacs OI with small profit booking seen at 8600 strike price. 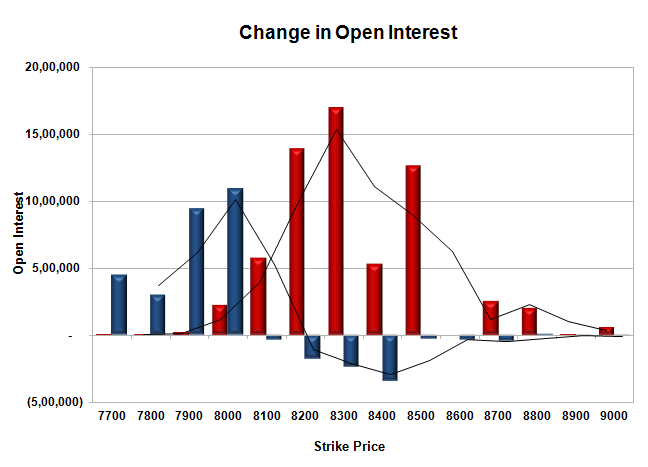 Put option 8000-7700 added huge 27.69 lacs OI with short covering seen at 8200 and above strike prices. 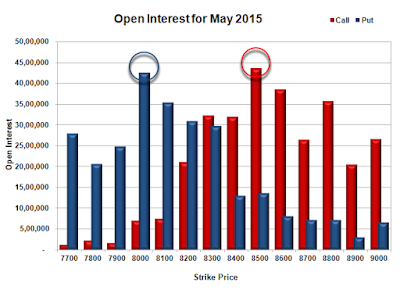 Nifty Open Interest is at 1,64,53,250 down by 3,38,800, with decrease in price, most probably huge long liquidation. Bank Nifty Open Interest is at 21,88,425 up by 3,98,425, with decrease in price, most probably huge-huge short build-up. FII’s sold huge 23.06 lacs Futures, which includes 62039 contracts long liquidation and 30217 contracts short build-up, with decrease in net OI by 31822 contracts (includes 74331 longs to 166587 shorts for the day) and the Average Price comes to 8771.21. FII’s Index future open contract as on date is 274052 Longs to 212872 Shorts, net long just 61180 down by 92256 contracts. Initial support now at 8100, with OI of 35.38 lacs and below that at 8000 with OI of 42.57 lacs. 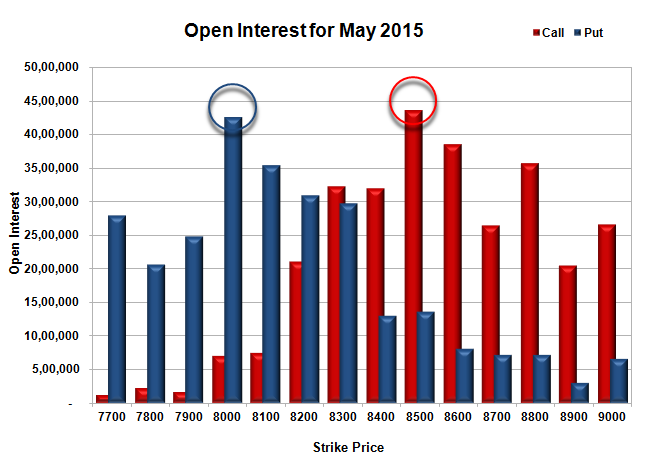 Initial resistance at 8200, with huge OI addition of 13.85 lacs and above that at 8300 with OI of 32.33 lacs. Day Range as per Option Table is 8055 - 8252 and as per VIX is 8014 - 8180 with 8171 as the Pivot.